A Tale of 3 Betty's | Oh Sarah O ! Way back in August 2010 I participated in Craftster's Ongoing ATC (artist trading card) Swap. For those of you who don't know, ATCs are 2.5" by 3.5" handcrafted cards that can only be traded (not sold). In order to participate in the swap, I had to PM a brief survey to the swap leader for approval, claim a fellow ATC swapper and post my own ATC wishlist on the forum, and wait for someone to claim me. 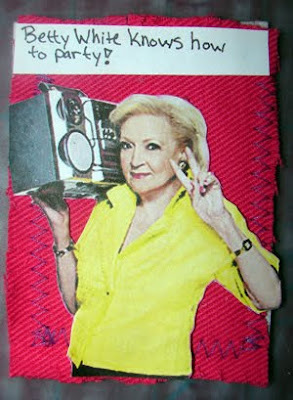 I was claimed by missmoppet and blogged about it here and I claimed shelina to make a Betty White themed ATC. I had so much fun that I ended up sending her 2 cards and keeping an extra for myself. 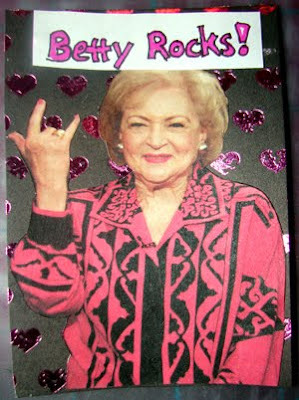 The first Betty White ATC that I made utilized an image from when Betty White hosted SNL. I used heavy weight interfacing for the base and zig-zag stitched a scrap of bright pink denim for the background for a classic Betty card. Next, shelina had indicated that she was a fan of the Anita Blake: Vampire Hunter comic book series, so I decided to combine her love of Anita with her love of Betty. 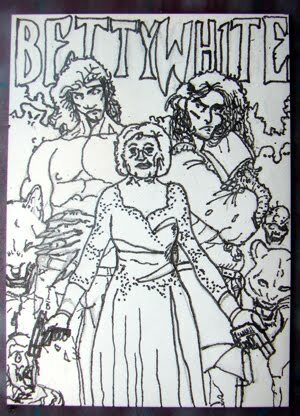 I hand drew the image in pencil and ink taking inspiration from some Anita Blake images online and some images of Betty White at the Emmys. Finally, I saw this image of Betty White and decided that I had to turn it into an ATC to keep for myself. This time I just applied the image to a bit of scrapbooking paper I had on hand. I had a lot of fun making these and would love to participate in another ATC swap. What do you think of my Betty White cards? Have you ever participated in an ATC swap or a Craftster swap? Would you like to participate in a swap or trade cards with me? Let me know in the comments below.